"Whether caused by wearing high heels on icy surfaces or just sheer accident, falls are one of the most common causes of weather-related injuries. Oftentime, wintertime falls result in an ankle sprain, or worse, a broken bone in the foot, ankle, heel or toe. I encourage patients to wear low-heeled shoes or boots with a traction sole to help prevent slipping," Catalano said. Water-resistant, insulated footwear provides a barrier between the feet and outside elements. This barrier is particularly important for people with neuropathy (nerve damage) or Raynaud's phenomenon (extreme sensitivity to cold), Catalano said. "While different, both conditions block normal blood flow in the feet and place a person at a greater risk of developing additional problems. In some cases, people can incur chilblains, which are itchy, tender, red patches that emerge in response to cold air, or in extreme cases, frostbite," Catalano said in a news release from the American College of Foot and Ankle Surgeons. It's also a good idea to wear moisture-wicking socks that prevent dampness from sweat, he added. Some people place foot warmers in their shoes, but Catalano said they can burn the skin and cause severe harm for people with nerve damage. He recommends talking with a foot expert before using them. If you do suffer foot and ankle problems, take appropriate action, Catalano advised. 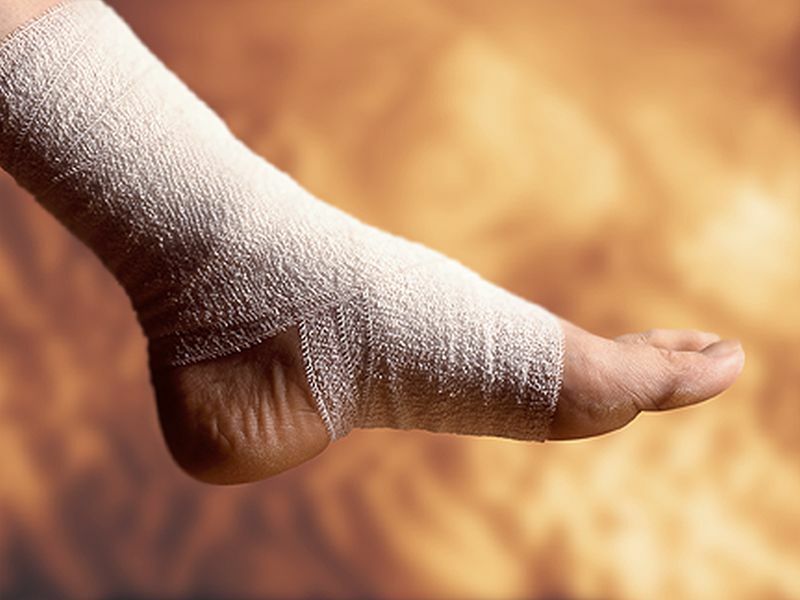 "In the case of a suspected fracture or sprain caused by a fall, see a foot and ankle surgeon or visit the emergency room as soon as possible for prompt diagnosis and treatment. If medical care is unavailable, for temporary relief of symptoms, try the RICE principle -- Rest, Ice, Compression and Elevation. But, remember, delaying treatment can result in long-term complications," Catalano said. If your feet are exposed to cold and dampness for a long time, soak them in warm -- not hot -- water. Avoid direct heat. A warm-water soak will allow your feet to regain their normal temperature gradually, he said.